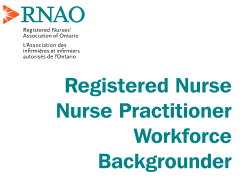 The RN/NP workforce backgrounder provides information about the nursing profession in Ontario. The report includes information about the number of nurses licensed to practise in Ontario, broken down by type — registered nurse (RN), nurse practitioner (NP) and registered practical nurses (RPN). Since RNAO represents RNs and NPs, there is a focus on these designations; however data on all nurses is included in this report. The report also includes demographics about the nursing profession including location, work status, multiple job holdings as well as nurse/population ratios. The information in this report is updated annually in order to ensure that it reflects the current landscape of nursing in Ontario. This is an invaluable resource that provides a comprehensive look at the size of the nursing workforce and its relation to the population that it serves. As of 2017, there were 167,254 nurses registered to practise in Ontario.